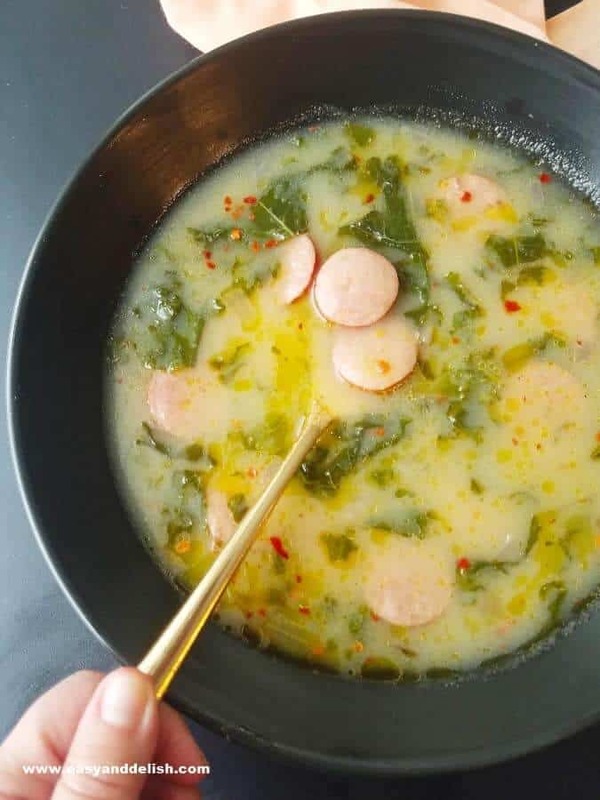 Portuguese kale soup is a traditional gluten-free and dairy-free soup from Portugal, very popular in Brazil, made from potatoes, sausage and kale. It’s easy and quick to make! Cold. Hot. Cold again… This is the weather in Texas lately. On a cold day like today, what would be the perfect dish for dinner (or for lunch, too)? Soup, of course! and Caldo Verde (Portuguese Kale Soup or “Green Soup”). Hmmmm… What to make today? I did not have to give it a second thought. Portuguese kale soup! 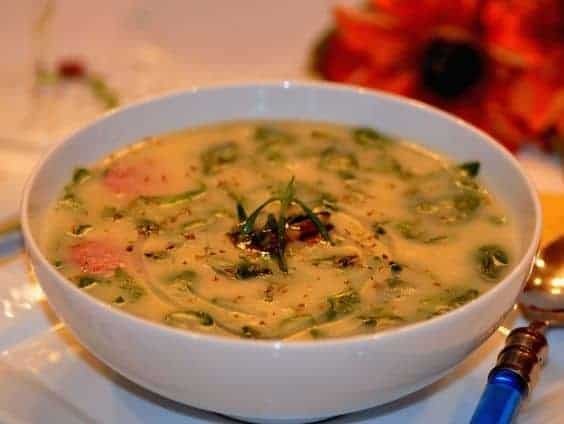 Although this soup is originally from Northern Portugal’s Minho region, it became a popular dish throughout all Portugal and Brazil. Brazil was once a colony of Portugal, and for a while during the Napoleonic Wars, was even its imperial capital and the home of the royal family. The color of the kale gave the soup its name. Broa is the bread that usually accompanies caldo verde. For instance, broa is a cornbread leavened with yeast which takes fennel in Brazil. Another reason to choose this Portuguese kale soup today instead of the other two mentioned above, is because it warms not only my tummy, but also my heart, too. 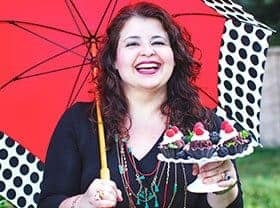 My memories of eating this dish back in Brazil are many… and wonderful! This soup has been present for years and years at the table of my family, which is descended from Portuguese immigrants to Brazil. 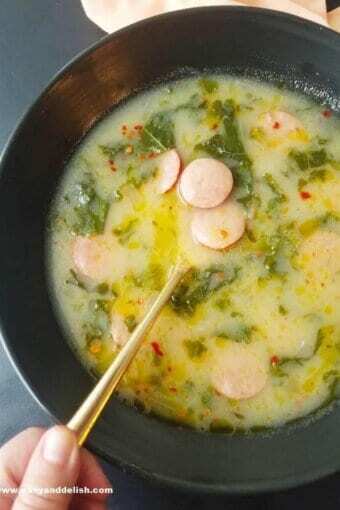 I can say that Portuguese kale soup or Caldo Verde is a family tradition passed down from generation to generation. In a large heavy pan, heat 1 tablespoon olive oil over medium-high heat. Brown the sliced sausage. Transfer only the sausage to a bowl and reserve. Leave any oil left over in the pan to sauté the onion and garlic. Using the same pan, heat the remaining tablespoon olive oil and add the onion. Sauté over medium-high heat until translucent (about 3 minutes). Then, add the garlic and sauté until slightly golden. Add the wine and let reduce a little bit (1 minute). Add the potatoes, water, the chicken bouillon, salt, and pepper. Bring to a boil. Reduce heat. Simmer over low heat until the potatoes are tender, about 15 minutes. Blend the soup well in a blender and return to the pan. Add the reserved sausage and the finely shredded kale. Let simmer until the kale is wilted (about 3 minutes). Taste and adjust the salt and pepper. Serve in bowls, drizzled with olive oil and sprinkled with dried oregano. Make Ahead: The soup can be refrigerated for up 2 days. 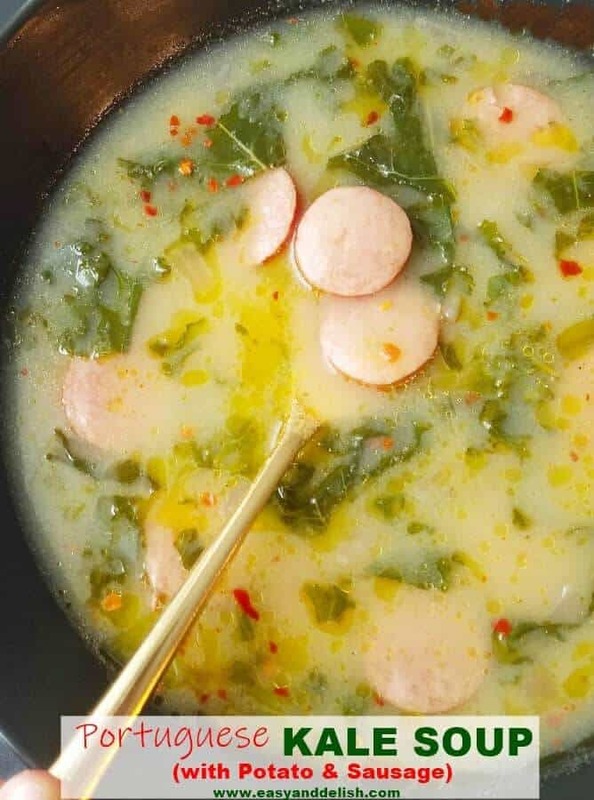 Portuguese kale soup is a traditional gluten-free soup from Portugal, very popular in Brazil, made from potatoes, sausage and kale. It's easy and quick to make! In a large heavy pan, heat 1 tablespoon olive oil over medium-high heat. Brown the sliced sausage. Transfer only the sausage to a bowl and reserve. Leave any oil left over in the pan to sauté the onion and garlic. Using the same pan, heat the remaining tablespoon olive oil and add the onion. Sauté over medium-high heat until translucent (about 3 minutes). Then, add the garlic and sauté until slightly golden. Add the wine and let reduce a little bit (1 minute). Add the potatoes, water, the chicken bouillon, salt, and pepper. Bring to a boil. Reduce heat. Simmer over low heat until the potatoes are tender, about 15 minutes. Blend the soup well in a blender and return to the pan. Add the reserved sausage and the finely shredded kale. Let simmer until the kale is wilted (about 3 minutes). Taste and adjust the salt and pepper. Serve in bowls, drizzled with olive oil and sprinkled with dried oregano. A crusty bread or preferably a Portuguese Corn Bread (Broa de Milho) and a rich white wine can be served as accompaniments. I HAD to leave a comment just to say how beautiful was your story with caldo verde. Truly a great read. Thanks so much, Didi! I am glad that you enjoyed my post… I do appreciate your visit! Wishing you a wonderful year!